There are no words to express the pain. Many on this forum have experienced this sadness. After a long illness, Loki is gone at the age of 13. Although we have another dog, a mixed chow/ newfy the house seems eerily quiet. I reluctantly took Loki. Our son found him wandering the city, in poor health. He was beautiful, an open face chow with such expressive eyes. 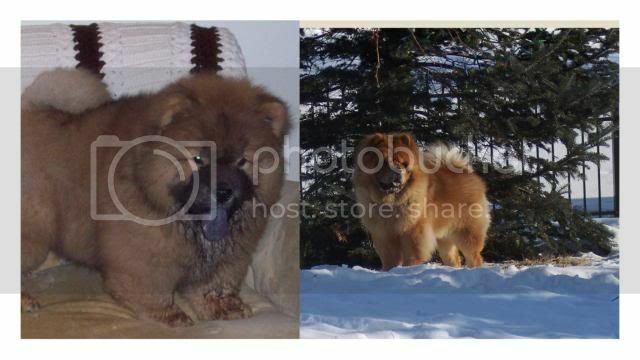 No one would take him as he was a chow and, even worse, a chow that needed medical care and surgery. I was fearful of chows. We already had a dog who was not in good health. It was to be temporary...until he had surgery to correct a bad leg. The inevitable happened...I feel for this dog like no other. I sometimes thought he could read my mind. He had some common chow traits. He could be stubborn, hated our rescue cat, never did learn to come when called but he was remarkable in so many ways. He was a great judge of character. if you crossed him in any way (one time my sister pulled a tuft of hair from his head and he didn't like it. He held it against her and ignored her when she came to visit. If he didn't like you, he would not take food from you, no matter what the treat happened to be. When my mother lay dying he would lay beneath her bed and wouldn't leave her side. I was concerned when the first grandchild came. How would Loki react? He was almost ten at the time. He was introduced to my grandson. Sniffed him from head to toe, and gave him a big wet kiss. He would be the first to run to his room when he woke from a nap and lay under the crib until I could get there. He was gentle with him. I loved him with every ounce of my being, there will never be another Loki. The purpose of this post is not just to memororialize an amazing friend and companion, but to suggest to you that sometimes life sends you something that you don't think you want but turns out to be the greatest of blessings. Awwww I'm so sorry! I know how bad it hurts! I am glad that he came into your life and happy for the joy he brought you while he was here. That joy will always be in your heart even though it is broken right now. Oh...I am so sad...between Loki and my Shiloh we were going through the same issues together. I hope Loki and Nahkohe had great meeting at Rainbow Bridge today. Many hugs to you - it might feel like your heart will never stop aching...eventually it eases but the mark is there and at some point you will be able to embrace their memory with a smile. I haven't been online in a while and just saw the sad news. My heart hurts for you. I hope you are taking comfort in the knowing that you gave Loki a wonderful life. It has been weeks, but it isn't easier. I have been looking into chow rescue organizations. In a way it feels disloyal to Loki but I can't seem to stop myself. from my experience, it will be a long time before the heartache will ease...as you know it was just a few weeks after my Chowboy passed that we adopted a GSD puppy. A puppy requires a lot of attention and in some way that probably helped to distract me from my sorrow...but sometimes I felt resentful because he wasn't Mr N...I think it's perfectly fine to check out other Chow rescues - at some point you will find that rescue that will be the next chapter in your life.